The Parc de la Villette is the third-largest park in Paris, 55.5 hectares in area, located at the northeastern edge of the city in the 19th arrondissement. 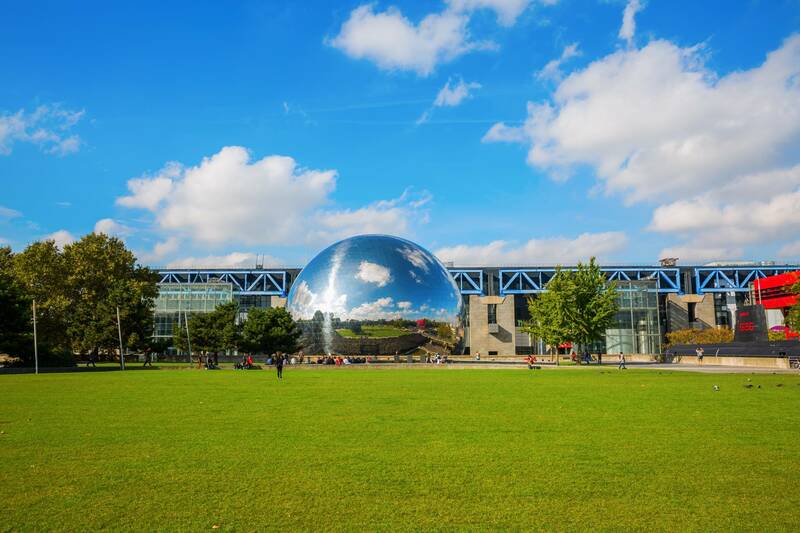 The park houses one of the largest concentration of cultural venues in Paris, including the Cité des Sciences et de l'Industrie (City of Science and Industry, Europe's largest science museum), three major concert venues, and the prestigious Conservatoire de Paris. Parc de la Villette is served by Paris Métro stations Corentin Cariou on Line 7 and Porte de Pantin on Line 5. Philharmonie de Paris, a new symphony hall with 2,400 seats for orchestral works, jazz, and world music designed by Jean Nouvel, opened since January 2015. Centre équestre de la Villette, equestrian center with numerous year-round events. Le TARMAC (former Théâtre de l'Est Parisien), venue for world performance art and dance companies touring from "La Francophonie", has mooved to 159 avenue Gambetta in the 20th arrondissement. Since its completion in 1987, the Parc de la Villette has become a popular attraction for Paris residents and international travelers alike. An estimated 10 million people visit the park each year to take part in an array of cultural activities. With its collection of museums, theatres, architectural follies, themed gardens, and open spaces for exploration and activity, the park has created an area that relates to both adults and children. Designed by Bernard Tschumi, the park is meant to be a place inspired by the post-modernist architectural ideas of deconstructivism. Tschumi’s design was in partial response to the philosophies of Jacques Derrida, acting as an architectural experiment in space (through a reflection on Plato's Khôra), form, and how those relate a person’s ability to recognize and interact. According to Tschumi, the intention of the park was to create space for activity and interaction, rather than adopt the conventional park mantra of ordered relaxation and self-indulgence. The vast expanse of the park allows for visitors to walk about the site with a sense of freedom and opportunity for exploration and discovery. The design of the park is organized into a series of points, lines, and surfaces. These categories of spatial relation and formulation are used in Tschumi’s design to act as means of deconstructing the traditional views of how a park is conventionally meant to exist. The Parc de la Villette boasts activities that engage all people of all ages and cultural backgrounds. The park is a contemporary melting pot of cultural expression where local artists and musicians produce exhibits and performances. On the periphery of the park lies the Cité des Sciences et de l'Industrie, the largest science museum in Europe. There is a convention center and an I-MAX theatre. The park acts as a connection between these exterior functions. Concerts are scheduled year round, hosting local and mainstream musicians. Dividing the park is the Canal de l'Ourcq, which has boat tours that transport visitors around the park and to other sites in Paris. Festivals are common in the park along with artist conventions and shows by performers. The Parc de la Villette hosts an annual open-air film festival. In 2010 the festival's theme was "To Be 20" ("Avoir 20 ans") and featured films about youth and self-discovery around the age of 20. In 2010 films were shown by American filmmakers Woody Allen and Sofia Coppola as well as French and international filmmakers. 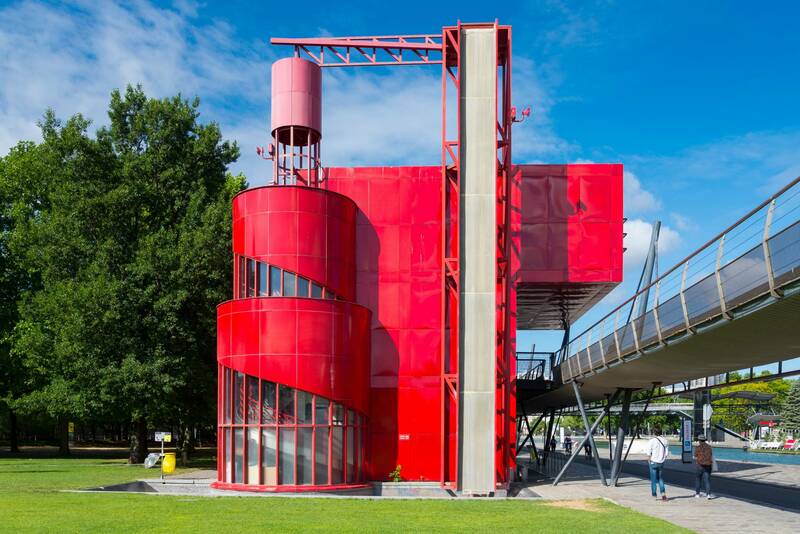 The Parc de la Villette has a collection of ten themed gardens that attract a large amount of the park’s visitors. Each garden is created with a different representation of architectural deconstructionism and tries to create space through playfully sculptural and clever means. While some of the gardens are minimalist in design, others are clearly constructed with children in mind. Le "Jardin du Dragon" (The Garden of the Dragon) is home to a large sculptural steel dragon that has an 80 ft slide for children to play on. The "Jardin de Bambou" (Bamboo Garden) at the Parc de la Villette was designed by Alexandre Chemetoff, winner of the Grand Prix de l'urbanisme (2000). The "Jardin de la Treille" (Trellis Garden) designed by Gilles Vexlard and Laurence Vacherot. Vines and creepers are going along a roof trellis and 90 small fountains designed so that you only really hear the murmur of them in between the grape vines. 7 Sculptures de visées (Sculptures Bachelard) by Jean-Max Albert are installed all around and an anamorphosis refection is displayed in a small pool. The gardens range in function; where some gardens are meant for active engagement, others exist to play off of curiosity and investigation or merely allow for relaxation. Probably the most iconic pieces of the park, the follies act as architectural representations of deconstruction. In architecture, a folly is a building constructed primarily for decoration, but either suggesting by its appearance some other purpose, or merely so extravagant that it transcends the normal range of garden ornaments or other class of building to which it belongs. Thirty-five follies are placed on a grid and offer a distinct organization to the park. Architecturally, the follies are meant to act as points of reference that help visitors gain a sense of direction and navigate throughout the space. While the follies are meant to exist in a deconstructive vacuum without historical relation, many have found connections between the steel structures and the previous buildings that were part of the old industrial fabric of the area. Today, the follies remain as cues to organization and direction for park visitors. Some of them house restaurants, information centers, and other functions associated with the park’s needs. There have been many criticisms of the innovative design of the park since its original completion. To some, the park has little concern with the human scale of park functions and the vast open space seem to challenge the expectation that visitors may have of an urban park. Bernard Tschumi designed the Parc de la Villette with the intention of creating a space that exists in a vacuum, something without historical precedent. The park strives to strip down the signage and conventional representations that have infiltrated architectural design and allow for the existence of a “non-place.” This non-place, envisioned by Tschumi, is the most appropriate example of space and provides a truly honest relationship between the subject and the object. Visitors view and react to the plan, landscaping, and sculptural pieces without the ability to cross-reference them with previous works of historical architecture. The design of the park capitalizes on the innate qualities that are illustrated within architectural deconstructivism. By allowing visitors to experience the architecture of the park within this constructed vacuum, the time, recognitions, and activities that take place in that space begin to acquire a more vivid and authentic nature. The park is not acting as a spectacle; it is not an example of traditional park design such as New York City’s Central Park. The Parc de la Villette strives to act as merely a frame for other cultural interaction. The park embodies anti-tourism, not allowing visitors to breeze through the site and pick and choose the sites they want to see. Upon arrival in the park, visitors are thrust into a world that is not defined by conventional architectural relationships. The frame of the park, due to its roots in deconstructivism, tries to change and react to the functions that it holds within. Parc de la Villette | eTips Inc.